Today Sydney once again enjoyed one of the premiere Music Festivals to hit Australia - the Future Music Festival. Randwick, in Sydney's eastern suburbs was blasted by festival goers, and for the most part, the crowd was not disappointed. 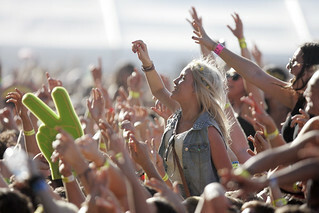 The fest which attracted 50,000 fans, had a line-up that ranged from Psy to alt-indie rockers The Stone Roses. Industry talk as some folks questioned the use of the phrase "future music" for bands who had found fame and success decades ago, including The Stone Roses and The Prodigy, despite both acts being strong drawcards for many fans at the event. There were plenty of other hot acts on the marquee included Rita Ora, Australian band The Temper Trap and Avicii. Well done to everyone involved in the success of this years Future Music Festival. ANNOUNCED AS THE EDM HEADLINER AT THIS YEAR'S FUTURE MUSIC FESTIVAL!! Future Entertainment can now officially confirm that chart-topping Swedish superstar and worldwide phenomenon Avicii has been added to the already monumental line-up for this year's Future Music Festival in March! Set to bring his massive production to the headlining spot of the EDM stage at this year's Future Music Festival, 2x Grammy award nominee Avicii has certainly proved himself as the EDM force to be reckoned with since he exploded on to the scene in 2011. Put quite simply, in the relatively short time since we first heard his name, Avicii has accomplished more than most artists would dream of in an entire lifetime. And, at just 23 years of age, Avicii is just getting started! Best known for his exquisite production skills, his prolific live performances and a string of international mega-hits including the worldwide phenomenon, 'Levels', (which conquered music charts worldwide racking up over 50 million YouTube views, and was declared David Guetta's "Tune of 2011") Avicii is without a doubt one of the most in demand artists on the planet. 2012 saw the Swede skyrocket. Kicking the year off with the 'House for Hunger' tour, Avicii and manager Ash Pournouri donated a staggering $1million to the organization 'Feeding America', by doing a not-for-profit 27-stop tour of the U.S. The year also saw him headline some of the world's biggest music festivals including Coachella, Ultra Music (where he was joined on-stage by pop queen Madonna), Lollapalooza, Electric Daisy Carnival, Tomorrowland, Exit Festival, Creamfields, Mysteryland, Austin City Limits. He was also recently ranked as the second-most influential under-30 person in music by Forbes magazine. Most recently, Avicii has launched the Avicii x You project which will see him collaborate with fans, producers and musicians from all over the world for his next single. All profits from the single will again go to the 'Feeding America' charity. 2013 will see this prodigal wiz-kid join the hallowed ranks of the Future Music Festival. The Day Of The Dead-Set Awesome is most certainly upon us and it's set to be all the more awesome with Avicii onboard! The unstoppable force that is Avicii will headline the EDM stage at this year's Future Music Festivals alongside fellow heavyweights Dizee Rascal, Hardwell, Steve Aoki, Madeon + many more. The Future Music Festival 2013 pinata has officially popped! It's the 'Day Of The Dead-Set Awesome' and this year Future Music Festival is set to rock your skulls off! We've been brewing something special, and full of more mind-blowing music than you can poke a cactus at... Future Music Festival 2013 is going to kick harder than a Tijuana donkey on peyote! Where else would you want to be? Our Casa is your casa muchacho! With the most innovative and dynamic line-up to date, Future Entertainment is bringing you a curated arena and two super-sized main stages jam-packed with the hottest talent the world has on offer. The Prodigy will give you the Warriors Dance Arena - an entire arena dedicated to hard-edged, and heavy bass driven music plus some of the world's most cutting-edge dub-step acts. The stage is set to showcase why this band deserves every sense of credibility and admiration attached to their name. It's going to be huge! Epic if you will. Joining them in the Warriors Dance Arena will be Boys Noize (Terminator-esque skull show! New album out this Friday), Feed Me Live (Live Teeth Show), FMF 2012 heroes Kill The Noize, Zeds Dead and Borgore. Another very welcome addition to the Warriors Dance Arena is international tastemaker and legendary DJ in his own right, Zane Lowe. This man has quite literally had a hand in the shaping careers of more than one of the artists on this line-up and has truly earned his stripes amongst the best. With each act as illustrious and defining as the next, be prepared... the Warriors are coming. Fresh from breaking records for the fastest selling rock tour in UK history (220,000 tickets in 68 minutes!) the pioneers of alternative rock The Stone Roses are bringing their Manchester-borne reunion tour to Aussie shores. Joining them on the live front are fellow Brits Bloc Party. Returning to Australia for the first time since the release of their critically acclaimed new album Four they'll be sending fans into an absolute frenzy as they make their debut Future Music Festival appearance. In a move unlike any other, International sensation and K-Pop superstar PSY has also been added to the bill. The recent online obsession over his Gangnam Style video has turned the South Korean into a global phenomenon. His single has had in excess of 400 million youtube views and has reached the number 1 spot in 33 countries and counting! Arriving in Australia this Sunday, Psy will perform on X-Factor and share with a captive nation his EX-PSY-TMENT about debuting his live show at Future Music Festival 2013. Off the back of a triumphant performance at the AFL Grand Final that saw their smash hit album Conditions soar back into a Top 10 position in the ARIA charts, our boys The Temper Trap will be showing the internationals how we hold our own. Adding a little more Oz to the concoction will be indie-rock wunderkinds Gypsy & The Cat - returning with a much anticipated new album mixed by superstar Dave Fridman (The Flaming Lips, MGMT) and a new single 'Bloom' which shot straight to number 5 on the world wide hype machine. Expect things to get a little bonkers with UK powerhouse MC and festival must-have Dizziee Rascal back on the bill. Fellow countrymen DJ Fresh and Rudimental have also had extremely impressive years. With a string of hits and sold out shows to each of their names respectively, these live acts know how to get the party started. Period. Also along for the ride we give you the chart-topping New York pop-rockers Fun. And you better believe it will be! This season, Future Music Festival has pulled together an array of the finest female talent on the planet. First up, hailing from Harlem, we have the hard-hitting, natural born lyricist Azealia Banks. With a much anticipated new album on the way, this provocative lady of the moment is all set to deliver a hot and heavy set featuring tracks from her hit EP '1991'. Next up, Rita 'This Is How We Do' Ora will be taking to the stage. With no less than 3 number 1 UK hits under her Alexander Wang belt and a slew of burgeoning international praise, 2013 is all about Rita's Ora! On the topic of UK sensations, Ellie Goulding will be making her much-awaited Australian festival debut. Rounding off an almost perfect female contingent are the ever-impressive Aussies (and Future Music favourites), Nervo. If ever there was an EDM all-star line-up, to end all other line-ups, this would undoubtedly be it. FMF 2013 brings you electronic icons Steve Aoki, A-Trak (Live), Madeon and Hardwell. The EDM A-Team has officially landed. The undisputed heavyweight champion of underground and heralded king of Ibiza, Sven V th will be bringing his Cocoon Heroes concept down under for the first time. Returning for his 5th performance on FMF, V th will head up the strongest techno line-up in Future Music history. We kid you not. Cocoon Heroes will showcase fellow techno-titans Richie Hawtin, Ricardo Villalobos, Seth Troxler and Magda. Featuring full lights and production, Cocoon Heroes will boast all of the elements that make this the best event on the white island each summer, and much, MUCH more! Trance-a-holics can look forward to riding every bone-tingling breakdown and build-up as we announce Wake Your Mind! Curated by none other than trance visionaries Cosmic Gate the Wake Your Mind stage will feature vocalist Emma Hewitt, W&W, tyDi, Super 8 & Tab and Ben Gold. Last, but by no means least Australia's very own The Stafford Brothers, Timmy Trumpet, Tenzin and Bombs Away will once again join the hallowed ranks. Hold on to your margaritas - these Aussies are LOCO!! Party time? Excellente. What is now a rite of passage for all music lovers, Future Music Festival is back! The Day Of The Dead-Set Awesome is upon us. This is the festivale de m sica futuro...Taco Taco muchachos! Boys Noize (Live debut) - Hardwell - The Temper Trap - FUN.